This issue opens with the TMNT being spit out onto an alien environment by a gigantic, disembodied cow head named Cudley Cowlick… cowabizarro! The Turtles learn that they’ve been kidnapped by intergalactic wrestling promoters Stump and Sling, who broadcast the galaxies’ most popular TV show light years beyond the Earth. 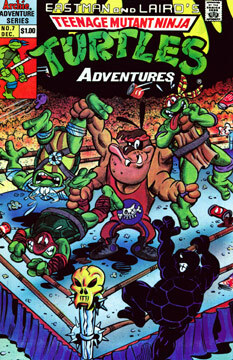 To win a return trip home, via the weird flying cow head, the TMNT will have to wrestle! The Turtles agree (what choice do they have?) and are introduced to the other wrestlers… one of which happens to be Leatherhead! It seems that Cudley rescued the gator boy from his deathly fall and brought him to Stump Asteroid to become a wrestler as well. Tons of madcap wrastlin’ ensues, and the TMNT wind up victorious (o’ course!). Stump makes good on his deal and has Cudley deliver the Turtles back to Earth – Leatherhead decides that he likes life in outer space, where he won’t be viewed as a freak, and so he stays behind to continue his wrestling career.